Côr y Dreigiau has gone from strength to strength since its formation in 2006 for the first series of the S4C television programme Codi Canu. Côr y Dreigiau is led by its musical director, Helen Robbins and assisted by accompanist Colin Beynon. 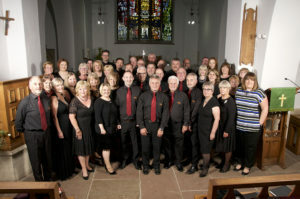 When not busy entertaining the rugby crowds at the Dragons’ games, the choir can be found participating in local festivals, entertaining guests at weddings and performing in charitable concerts. It is very proud of its charitable work and has helped to raise several thousand pounds over recent years for various local and national charities. Côr y Dreigiau rehearses fortnightly on Tuesdays at Llanyrafon Primary School in Cwmbran and new members are always made most welcome. Additional information about the choir can be found on the choir’s website: http://www.corydreigiau.org/ where there is an opportunity to make contact with the choir.